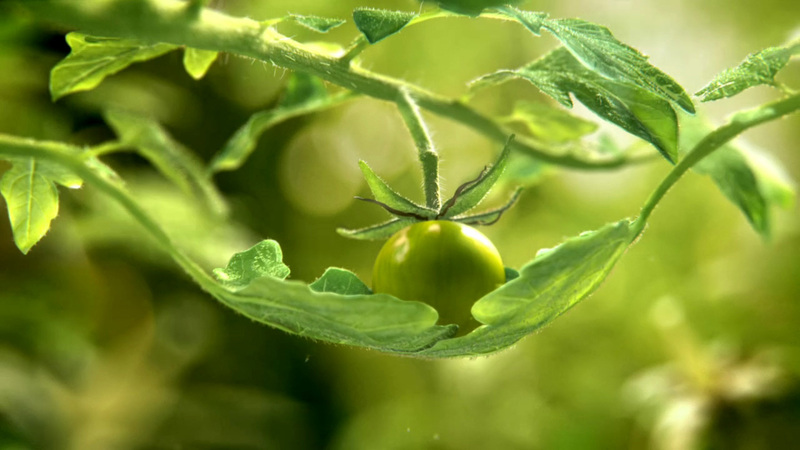 Director, and The Mill NY's lead CG artist on the Pampered spot, Ben Smith meticulously plotted a series of shots to show a tender seedling growing into a vine which tenderly pampers and protects its ripening tomatoes. The blend of live-action and animation needed the expertise of DP photographer Michel Amado Carpio in Guadalajara, Mexico. "Michel took time-lapse photography over 22 days, which provided reference for our animation," Ben explains. "From it, we could analyze how the plants actually grew. We also used some as background plates for the final composite." A rough edit followed a two-day shoot in Mexico. 'We cut the footage and got our broad-strokes idea of timing and pace," says Ben. "We kept the beginning and end, but the middle was created digitally." The greatest challenge was to get the tomato plant appear to grow naturally. "We had a live plant," Smith adds, "so we could observe how light passed through leaves, and the veins and hairs that are visible in a macro world. All such details and the shallow depth of field give the spot its realistic feel."